Try this easy pasta recipe tonight. 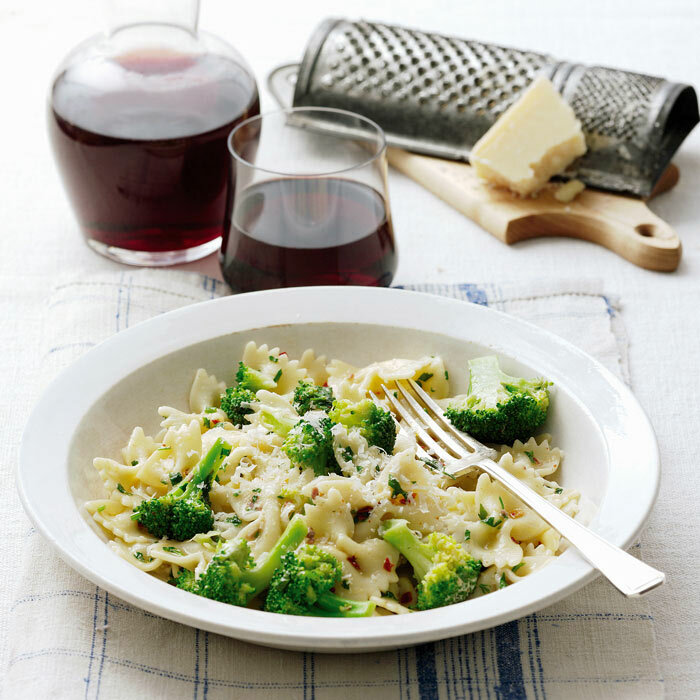 Farfalle pasta combined with a quick tomato sauce, protein-rich cannellini beans, and nutrient-packed broccoli rabe make this a tasty and healthy pasta dish. Meanwhile, in a large saucepan, heat oil over medium. Add onion and a pinch of salt; saute for 6 minutes or until golden. Stir in garlic, chili flakes, and broccoli rabe. Cook for 8 minutes or until greens have softened. Stir in tomatoes and minced oregano, along with another pinch of salt. Reduce heat to medium-low and simmer gently. Once water comes to a boil, add farfalle pasta and cook for about 7 minutes or until al dente. Halfway through simmering sauce and cooking pasta about 5 minutes add beans to sauce, crushing them slightly with a potato masher or a fork to thicken sauce. Continue simmering sauce for another 5 minutes while pasta cooks. Drain pasta and immediately return to cooking pot. Add half the sauce and stir to mix. Divide farfalle pasta among 6 plates and top with remaining tomato sauce. Top with cheese and oregano sprigs, if desired. Recipe courtesy of Solage Calistoga Resort in Calistoga, CA. Nutritional information includes 1/4 teaspoon of added salt.